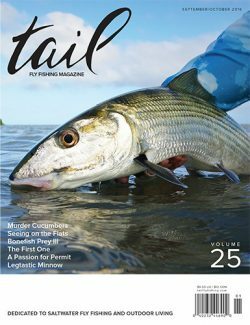 The Striped Bass, or “striper,” are one of the most avidly pursued of all coastal sport fish. They are highly prized for their size, battle on the line and culinary merit. Stripers are native to the Atlantic coastline of North America from the St. Lawrence River into the Gulf of Mexico to approximately Louisiana. They are anadromous fish that migrate between fresh and salt water. Striped bass spawn in freshwater and although they have been successfully adapted to freshwater habitat, they naturally spend their adult lives in saltwater. Stripers can live up to 40 years and can reach weights greater than 100 lbs., although those larger than 50 lbs. are rare. Females reach significantly greater sizes than do males; most stripers over 30 lbs. are female. Males reach sexual maturity at two or three years of age, however, females will not mature before the age of four and some not until the age of six. The heaviest concentrations of striped bass on the east coast are from Massachusetts to North Carolina. On the west coast from Oregon to southern California and in land-locked lakes like Lake Mead near Las Vegas and the Santee Cooper reservoir system of South Carolina. They thrive in all kinds of conditions but are seldom caught far from shore. In Massachusetts, for example, they are well known for feeding in the surf of Martha’s Vineyard and Chappaquiddick Island. Conditions here can be challenging for fly fishing but right behind the island is Cape Pogue Pond where the water is often flat calm and perfect for wading and fly casting for stripers. The diversity of habitat for this species is nowhere more obvious than in New York. Montauk Point is legendary for surf fishing for these fish and there are fly fishing enthusiasts who succeed here when conditions are right. Heading back toward New York City is Long Island Sound. This body of water is about 125 miles long with dozens of harbors on both the north shore (Connecticut and Westchester, NY) and the south shore (Long Island and Queens, NY). Every harbor has rock piles and beaches frequented by these fish. Early morning drifting and blind casting works well, as does wading where there is access. Striped Bass feed most actively at dusk and dawn, although some feeding occurs throughout the day. During midsummer, they tend to become more nocturnal. Stripers are particularly active with tidal and current flows feeding on fish, crabs and clams along the shore as they are tossed about in turbulent water. Striped bass will eat just about anything. They have been caught on every kind of baitfish, sand worms, blood worms, ribbon worms, clams, crabs, squid, and grass shrimp. The problem is they most often are focused feeders; feeding exclusively on one of the above mentioned until full, often switching to something else on the next feeding cycle which is usually tide driven. Many of their food items can be hard to duplicate with a fly. 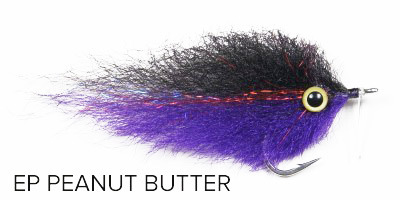 Sometimes the bait guys make out best, but usually a fly works incredibly well. Of all the bait fish around, stripers feed most heavily on sand launce (commonly called sand eels), spearing (commonly called silversides), and menhaden (commonly called mossbunker). The latter is the most difficult to simulate as the body shape of the fish is flat and deep, requiring the materials to stay fluffed in the water rather than collapsing to a thin profile when the fly is stripped in. Using a keeled hook helps keep that shape. 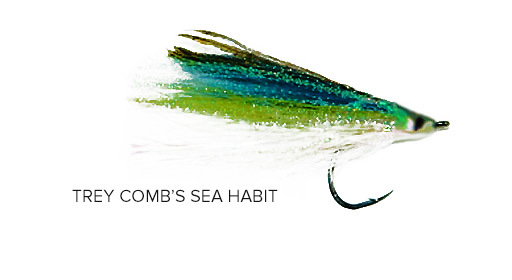 When stripers are feeding on baitfish many generic flies of the right shape and color will do the job. The most common are Joe Brooks Blonde series bucktail flies, Lefty’s Deceivers, and Clousers with green and silver being a good bet. All of these can be fished on floating or sinking lines. If you don’t want the expense of having a sinking and floating line or seldom use a sinking line, then a great addition to your arsenal is an Instant Sink Tip System. This is a temporary and simple loop to loop sinking tip that you attach to your fly line and then your leader to it. It is 5 or 6 feet long (depending on main line weight) and will take your fly down at about 5 feet per second, of course not as deep as a true sinking fly line. Note that this weighted addition takes a little getting used to as it changes the dynamics of the way your rod casts since it is “tuned” to the original weight of your fly line. Then of course there is the aggressive nature of the striped bass. Like all bass, they can be “bothered” into striking. A fly rod popper directed at a sighted target or cast blindly on calm waters is quite irresistible and will usually invoke an explosive strike. Tackle-wise, most fly rodders chasing striped bass fish 6 to 10 weight lines, the choice governed by wind conditions more than fish size. Most of the fish will be in the 3 to 20 pound range and they fight! When stripers go on a feeding frenzy, they drive entire schools of baitfish to the surface where water is splashing everywhere, terns and gulls are screaming and diving, and baitfish and bass are flying into the air. Almost any fly will work then. To further demonstrate their range of habitat we look at the East River, Harlem River, Hudson River and New York harbor itself. All of these hold huge numbers of striped bass and with the right conditions (mostly tidal) they are great targets for the fly. To continue enumerating places to fish would just be to drone on. You get the idea; striped bass can be found almost anywhere and are great targets for fly fishing. Local knowledge can’t be beat, so find a good tackle shop that specializes in fly fishing and find out where they have been biting and on what kind of bait, if not the actual fly pattern. Oh, one word of caution. 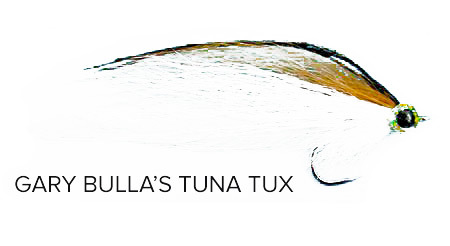 Bluefish are often feeding side by side with striped bass and are faster to the target. If you get cleanly bit off add a short trace of nylon covered metal leader to your flies as you can knot it. Hooking a bluefish is not a bad thing, especially on a fly rod as they put up a pretty great fight as well.